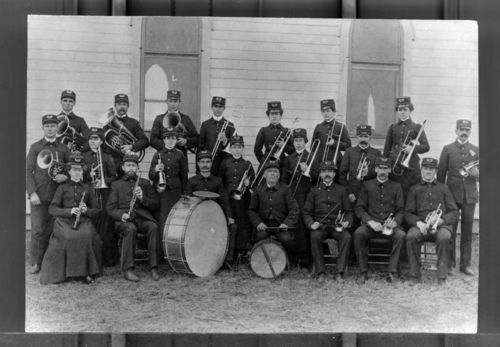 This is a formal portrait of the members of the Randall Band, which was the first band in Jewell County, Kansas, posed before an unidentified building, possibly the east side of the Methodist Church in Randall. Pictured are: (left to right) Back row: Bob Sadler; Charley Schott; Allie Crawford; Jesse Kibbe; Grace Hall; Clara Fairchild; Monta Seaver. Middle row: Edwin Shoemaker; Jennie Way; Lola Townsdin; Edith Bowman; Lily Kibbe; George Bruch; Elmore Sadler; Front row: Bertha Morris; Dr. Way; C.M. Conley; James Shaul; Ed Bowman (leader); Charley Kibbe; Will Hall.